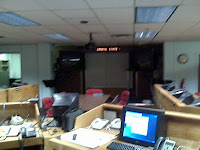 DEM is accepting applications for the 2010 Emergency Operations Center (EOC) Grant Program. Application information is available on DEM's 2010 EOC Grant Program Info Page, including instructions and a template for completing applications. The Federal Emergency Management Agency grant guidance and the grant's frequently asked questions are also posted. Applications must be submitted electronically to DEM no later than January 29, 2010. Please note there is only approximately $10 million available nationally, so applicants will face strong competition. For more information, contact Bob Wold at bob.wold@state.co.us or by phone at 720-852-6631. The mitigation and preparedness elements of emergency response are the ones that make the others - response and recovery - more manageable for communities and response entities. There are many partners we here at the Division work with to engage in mitigation and preparedness activities, before a disaster, to help identify, assess and confront disaster-related challenges. I understand from Marilyn Gally, State Hazard Mitigation Officer, that one those groups we work closely with, the Colorado Chapter of the International Code Council (CCICC), was recently recognized as the 2009 International Code Council Chapter of the Year. According to the ICC, "to earn this designation, a chapter must demonstrate a high degree of professionalism in promoting the vision, mission and goals of the Code Council. The Chapter of the Year also distinguishes itself through the development and implementation of programs designed to the increase the professionalism of its members and code officials everywhere, and participate in local, state, regional or national activities to increase the public awareness of safety in the built environment." Of specific interest to the Colorado emergency management community, the award was given, in part, to recognize the disaster assessment evaluator training and the chapter volunteer's support to the Windsor tornado (May 2008), where, according to CCICC President Stephen Kanipe, "volunteers assessed more than 1,000 damaged structures and then worked with local aofficials to process more than six-thousand repair permits." The chapter provides a wealth of training activities and resources in Colorado, all of which are designed to make buildings and our communities safer. One of the resources that the CCICC offers that, if you are in emergency management, you should check out is their updated "CCICC Disaster Operations Manual" as the field guide for how to initiate a disaster response, perform building damage assessments, engage in mutual aid agreements and other disaster-related actions. Too, if you are interested in disaster assessment operations response training from DEM, check out the Disaster Assessment Course announcement for January 2009. Just a reminder that the blog will not be updated until Monday, 28 Dec 09, due to labor hour restrictions regarding non-emergency response actions associated with the state employee furlough week. As always, the DEM Duty Officer remains on call and available to assist emergency service personnel. Have a great holiday weekend everyone and STAY SAFE!!! Hey all - the next Front Range Emergency Management Forum will be held on 13 January 2010, from 9:30 am - 11:30 am at the Arapahoe County Sheriff's Office (1301 East Broncos Parkway - Training Room One, Centennial, CO 80112). Please plan to attend if your schedule permits. If you cannot attend but would still like to offer suggestions for improving future FREMF activities, please email your ideas to Bob Wold at bob.wold@state.co.us or to Lori Hodges, DEM Field Manager, at lori.hodges@state.co.us. Many of you will be headed up into the mountains over the holiday weekend. So, given that the storm effects are always compounded by volume of persons on the road, we just wanted to remind everyone to be safe and slow down. We want all of you to get there alive! 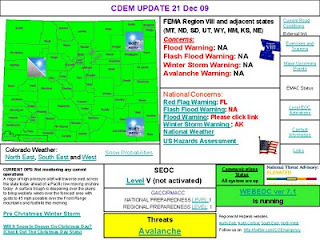 Take a second, too, to get the latest info about the conditions around Colorado. There are several great tools to do this. For the latest in road and traffic info, be sure to check out the Colorado Department of Transportation's COTRIP site. There, you will find maps, traffic cameras and info regarding the latest road conditions. Too, CDOT maintains a twitter feed @ColoradoDOT. Obviously (and not just because of the new law prohibiting you from doing so...) don't check the twitter feed while driving, but if you stop or you have someone who can check it for you, do so. They are posting great, timely info about plow activities, closures and road conditions. Also, be sure to keep an eye on the weather. This is Colorado. The weather changes fast, particularly in the high country. So, make sure you check in with the National Weather Service - Colorado Weather site during your travels, too. And, as always... pack an emergency kit for your car. You never know what might happen. You might need it. If you don't need it, great. If you need it and you didn't pack it, you will regret it. Don't be a statistic. If you have not seen it, the U.S. National Response Team has published an updated response team Joint Information Center model (two versions - one print ready and one automated) on their team Guidance, Technical Assistance and Planning page. Since I am currently deep in drafting of a comprehensive, Colorado-specific Joint Information System/Center Manual, PIO Field Guide(s) and a Crisis Communication Guide to help PIOs respond to specific threats faced in Colorado, the posting is a welcome reference tool. I will be drawing heavily from the guidance in this manual, as well as others as we further develop our Colorado system here at the Division. The intent of our effort is to codify procedures for the State, as well as, generate a toolkit for consideration by any organization involved in emergency management/crisis communications in Colorado that provides specific contacts, checklists and is designed to work within how Colorado emergency management is organized - including how to integrate into and use Colorado's online emergency management tools to help in your day-to-day functions. In any event, the NRT JIC Model is very well organized and thorough. It is also, obviously, compliant with the National Incident Management System (NIMS) and the Incident Command System (ICS). The Job Aids, References, Worksheets and Samples, in particular, are well done. What the work being done here at the Division is intended to do is provide a crosswalk of the fully-functional, well-staffed and resourced goal and the reality of most local Colorado PIOs who might not have those capabilities ready to launch. In any event, I thought those of you in PIO-world would enjoy taking a look and, if you have any questions about the Division's efforts on this front or are interested in being involved down the line as we develop the local tools, shoot me an email at brandon.williams@state.co.us. I'd be happy to write/talk to you about it! On 26 Jan 09, the Division, in cooperation with the Morgan County Office of Emergency Management, is hosting a half-day (9:00 am - 12:30 pm) workshop for those who might be involved in or perform a damage assessment after a disaster. 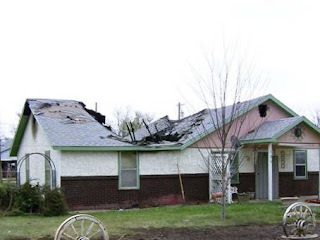 Damage assessments are critical immediately following a disaster to size up the impact(s) of damage. The course is intended for new personnel or as a refresher course. To register, go to the DEM Training Page and fill out the 75-5 EZ Form and the course is first come, first served to register now! For more information, contact DEM's Training Officer - Robyn Knappe at robyn.knappe@state.co.us or at (720) 852-6617. Attention First Responders who are hazardous materials techs, the Advanced Chemical and Biological Integrated Response Course (ACBIRC) has announced it will hold 10 courses between now and August 2010. The course is funded by FEMA so there are no costs to attend the training. For more information ABCIRC and for registration/dates, check out the ABCIRC site. Alternatively, you can contact Ashley Erickson, ACBIRC Training Coordinator at ashley.m.erickson@us.army.mil. For other emergency management-related Colorado training information, contact Robyn Knappe at robyn.knappe@state.co.us or at (720) 852-6617. The 2009 Northeast Colorado Regional Hazard Mitigation Plan has been posted to DEM's Local Pre-Disaster Mitigation Plans Page. It is a big, big document and I will work to figure out a way to make it smaller or break it up into bite-sized pieces. However, I wanted to get it up online as a reference document for regional, multi-county planning efforts, as soon as possible. The NE Regional Hazard Mitigation Plan is an updated plan from the 2004 version. It is a comprehensive Regional Hazard Mitigation Plan covering the counties of Cheyenne, Kit Carson, Lincoln, Logan, Morgan, Phillips, Sedgwick, Washington, Weld and Yuma Counties in Colorado. Hazard Mitigation plans are designed by communities to gather data about risks they face, analyze potential impacts and losses such risks could cause and develop action plans to address the most critical and threatening issues. In short, they serve as the backbone of how a community plans to better protect its people and property from the effects of natural hazard events. Once generated, the plans help decision makers direct mitigation activities and resources as well as maintain a community's eligibiltiy for certain federal disaster assistance, specifically, the Federal Emergency Management Agency's (FEMA) Hazard Mitigation Grant Program (HMGP) and Pre-Disaster Mitigation Program. The point of contact at DEM for questions on the NE plan is Deanna Butterbaugh. For examples of other regional and single county plans, check out DEM's Local Pre-Disaster Mitigation Plans Page and, in particular, check out Park County's Hazard Mitigation Plan and Elbert County's Hazard Mitigation Plan. 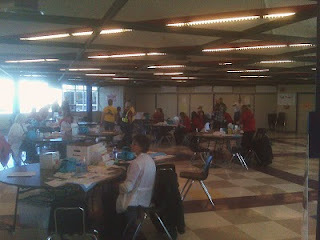 Quick pic from Alameda High School from this morning (Sat, 19 Dec 09) I got from DEM's Kerry Kimble, where responders from the Colorado Department of Public Health, local health officials, the Jefferson County Incident Management Team, local emergency medical services and mental health reps are running an H1N1 flu clinic. The team is managing the clinic using the Incident Command System (ICS) to manage an the event. Good reminder that using ICS for non-emergency response is a good way to train! Understand from Kerry that 800 have been processed thus far (11:00 am). Looked around and it seems there are further postings about the event at http://twitter.com/unflu and also at Immunizecolorado.com. Earlier this week, several DEM staff went out and fired up our old, Alternate Emergency Operations Center. It might look old, but it still fired up! 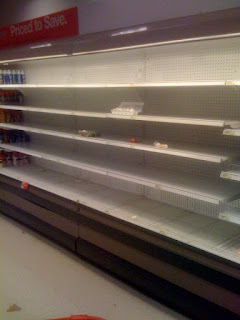 We were able start up the computers, log in and gain access to necessary emergency management sites. We were also able to verify that phone systems work and identify some alternate configurations and use of space that might fit the way we are structured today a bit better. While the EOC still remains a functional command post, it was originally built as a nuke bunker and it has the distinct feel of being in a museum. On the way out, I snapped the picture of the dedication plaque and thought I would share. 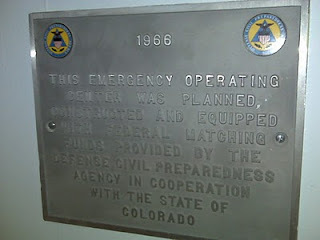 The Defense Civil Preparedness Agency was the predecessor of today's Federal Emergency Management Agency. It was cool to see that our relationship with our federal partners goes back that far and still remains strong. I still hope we never have to use it, but it is comforting to know that it is there and that, if we really had to, we could walk in today and get to work. If you are in emergency management in Colorado, are a backcountry enthusiast or just a another snow nerd, you are probably already familiar with the great work of the Colorado Avalanche Information Center. What you might not be aware of is that the CAIC has started to post updates on a number of geographic-specific twitter feeds for real-time updates of warnings, snow conditions and over-the-horizon analysis. The feed(s) can be found on the CAIC page buried in the 'help/about' tab at http://avalanche.state.co.us/pub/follow.php. Take a look, the tool is just developing but as we get into the winter season, I think this will be a valuable tool for all of us. In particular, the ability for the CAIC to receive updates from people in the field and maintain an in-the-field accessible communication about conditions, I think, will be extremely valuable. CENTENNIAL, CO. Dec. 8, 2009--Cooperative efforts between the Colorado Department of Agriculture (CDA), the Eastern Colorado Incident Management Team and officials from Weld County have created the first ever Memorandum of Understanding (MOU) for All-Hazard team response within Colorado. The MOU allows CDA to call up the Eastern Colorado Type-3 Team to assist in management of domestic agricultural incidents when CDA determines the needs of the incident exceed current staff and resource capabilities. 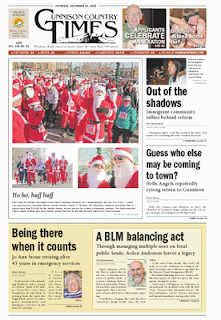 Agriculture Commissioner John Stulp and Weld County Sheriff John Cooke signed the agreement recently. The Weld County Sheriff is the Sponsoring Agency for the team and can activate the entire 40 member team, or elements of the team to assist during crisis operations within Colorado. Commissioners of Kiowa County stepped in to assist in procuring items funded by Agriculture to equip the team with communication, logistical and other support items. Because of this agreement, other counties may also be able to use selected parts of the emergency response equipment when the team is not deployed. Chad Ray, Incident Commander of the team said, “this is a big step for the CDA and the Team that allows us to assist Agriculture and support them during any incident.” The Team has already deployed to Alamosa during the salmonella outbreak, supported the State Division of Emergency Management, the Democratic National Convention and provided wildland fire and blizzard emergency assistance since being organized in 2007. The Team is made up of response professionals from all disciplines including safety, planning, operations, logistics, administration, finance, liaison, information and other specialties.